When I was about ten years old, I read about Eleanor of Aquitaine in the book De Gouden Dolk [The Golden Dagger] by Thea Beckman. Eleanor is a minor character in the book; the employer of a servant that the main character, a young crusader, fell in love with. Queen Eleanor fascinated me. I found out that she was born about 1124 and died at age 80 in 1204. She was the Duchess of Aquitaine in her own right, and the only woman ever to be Queen of both France and England, by virtue of her marriages to Louis VII of France and Henry II of England. She joined her first husband on crusade and was rumored to have had an improper relationship with her uncle Raymond of Antioch. Her children include the famous King Richard Lionheart and King John (Lackland), who signed Magna Carta. Eleanor was controversial, a strong woman in a man’s world. I have to admit I’ve become somewhat of an Eleanor-groupie. I have a whole bookshelf with publications about her. I’ve visited the castle at Poitou where she was grew up and later stayed to govern Aquitaine. 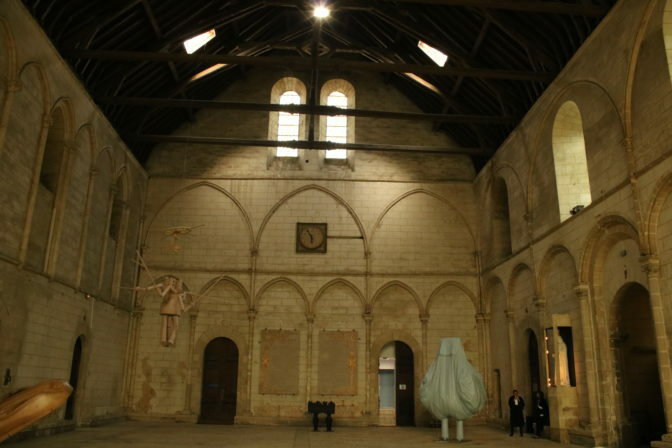 Great Hall of the Dukes of Aquitaine in Poitiers. Photo by author. 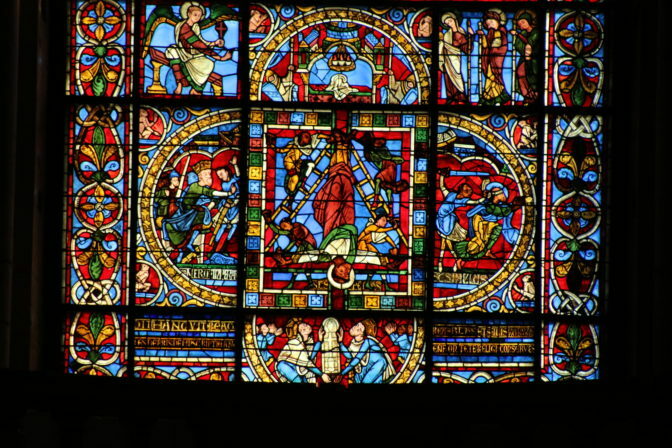 Window in Poitiers church showing a dedication by Eleanor and Louis VII in the bottom pane. Photo by author. I’ve visited the castle at Chinon where she lived with her first husband, King Louis VII. 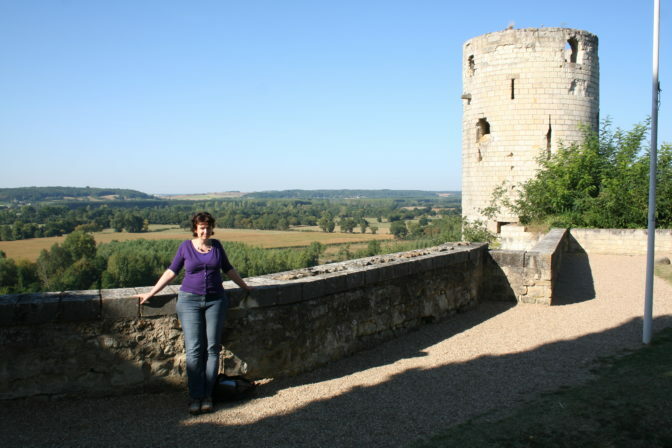 Yvette at Chinon castle overlooking the Loire valley. Photo by Remco Hulshoff. 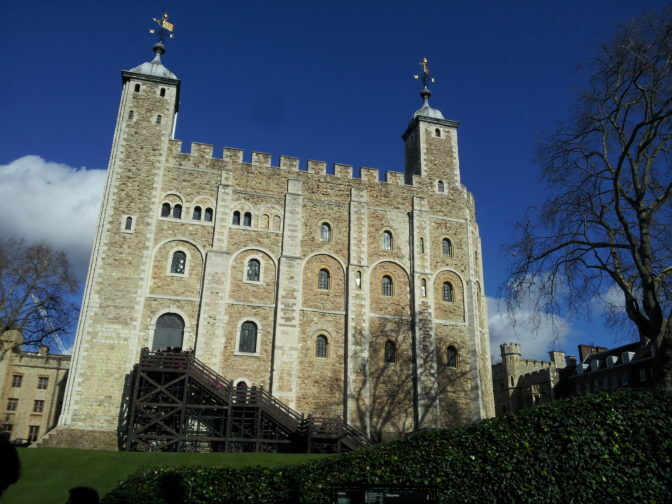 I’ve visited the Tower of London, her main residence when she was in England. Tower of London. Photo by author. 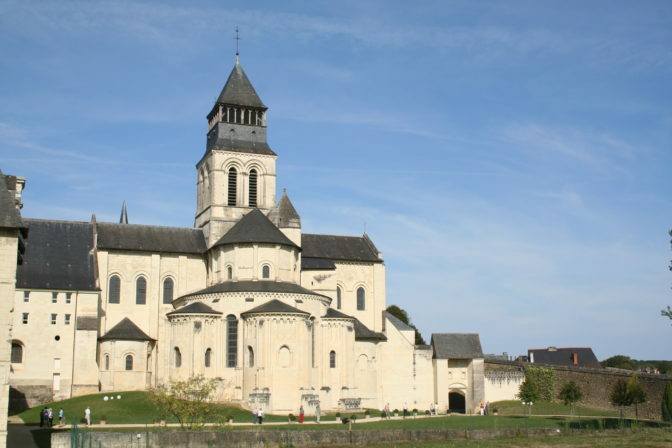 I’ve visited the Fontevraud Abbey where she spent her final years and where she’s buried. 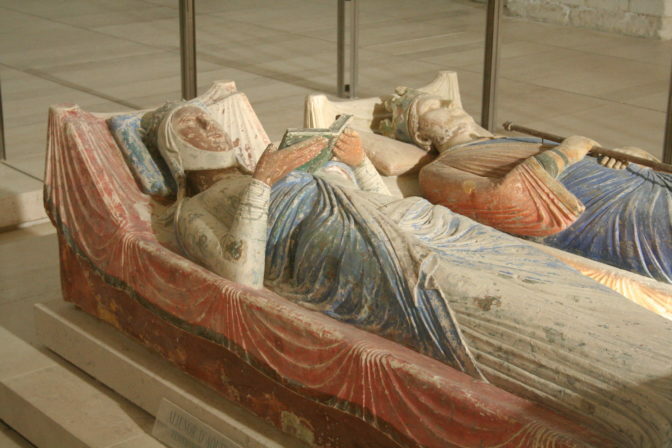 Tomb of Eleanor of Aquitaine at Fontevraud Abbey, next to her second husband Henry II. Photo by author. Fontevrauld Abbey. Photo by author. My husband is no longer surprised if our seemingly random holiday destination turns out to have a link to Eleanor. When I am interested in a topic, I mean it! Can you imagine my delight when, after doing genealogy for several years, I found documentation that one of my ancestors was a descendant of the Dukes of Brabant, and that they in turn were descendants of Eleanor of Aquitaine? Eleanor is supposedly my 26th great-grandmother, in generation 29, with the impressive Kekule number 445,479,215. How cool is that? There is just one problem. As my genealogical skills grew, I realized that the documentation just isn’t up to par. Some links are completely undocumented, and the few citations for the early lines refer to publications and not to original records. I have to face the truth: my line of descent from Eleanor of Aquitaine does not meet the Genealogical Proof Standard. It doesn’t even meet the first criteria: Reasonably Exhaustive Research. I haven’t done any research beyond studying some of the available published literature. I don’t have one shred of reliable evidence for several of the early links between me and her. This doesn’t mean that the links are incorrect, however. They could be correct. PLEASE let them be correct! So it’s back to square one. Starting with myself, I am going back one generation at a time, finding reliable documentation, analyzing it, and proving the parents before moving on to the next generation. If I can do that twenty-eight times, I will have proven my line of descent. I invite you to come along on this journey, which I will write about in a series of blog posts. Each blog post will document one link between me and Eleanor and provide you with real-life examples of research possibilities and challenges in the Netherlands in different periods. It’s probably going to be a long trip, since I don’t have much time to work on personal projects, so don’t expect a quick resolution. For the early period, sources are scarce and will require on-site research in the Netherlands, France, England, or Belgium. On the other hand, the series could end quickly if I discover that one of the reported ancestors is incorrect. You can follow the blog posts via this website or by signing up for the free Dutch Genealogy Newsletter. The blog posts will be filed under the Eleanor of Aquitaine tag. I will kick off the blog posts for each link next month, starting with myself. Next up: Generation 1 – Yvette Hoitink. my daughters are also allegedly descended from Eleanor of Acquitaine via the van Arkel line. I have found a family tree on line which I am trying to validate generation by generation, a slow process. There is good documentation until about Anna Van Arkel (1409) through her son Floris De BRUIJN (1450) but before that I am struggling to document the connections back to Thiebault 11, Duc de Lorraine (1261-1312). I am following Yvette’s story with interest. I can more or less follow Dutch language but can’t write it, apologies. I too am an Eleanor fan. Your endeavor to prove your connection appeals to me greatly! What fun. I am so jealous, I can’t imagine any famous ancestor in my line. Just peasantry as far back as I can go. Good luck, I’ll enjoy reading each installment. I think that is a TREMENDOUS and exciting quest! Oh, I hope it is true! I can’t wait to follow your blog posts. Have you seen the movie, The Lion in Winter? I love that movie, and I love Katherine Hepburn as Eleanor. I still haven’t seen that movie! Thanks for reminding me, I should try and find it somewhere. I don’t think Netflix has it but maybe I can rent it someplace. Hoi! I had the good fortune to adopt genealogy as my principal hobby in 1948 when I was 16 years old.For a few years, I too was enthralled with the then published books detailing the various entanglements of the French and English noble lines which invariably lead one back the venerable Eleanore of Aquitaine and Poitou.The computer hard drives where my lines to Eleanore were stored have long since been consigned to the dumps and my current drives do not contain these lines.I did, however, print out Ahnenntafels for my two German grandaughters, and a quick perusal of my remaining copy shows Eleanore in at least one instance as ancestress number 71614729. I will follow with interest your journey back in time along the well-traveled road. I doubt if DNA testing will be of any use to you in your quest, but it would be convincing if it did. I also have some Dutch lines and may consult you someday about them. Everyone of my surname in The Netherlands is descended from my ancestor Pieter Blankman, who lived near Oudesluis, de Zijpe, Noord Holland, ca. 1565. The name was originally spelled Blanckman and per my Y-Chromosome test results, Pieter’s ancestors probably came there from Finland, of all places! DNA testing would not be of use in my case. It is too far back for autosomal DNA of Eleanor to have made it to me (and if it did, to prove that it’s from her and not of the thousands of other ancestors I would share with my matches that far back). And Eleanor is not in my strict female line, so mitochondrial DNA is not helpful either. But you do make me wonder if any strict female line descendants of her are still living. Finland and De Zijpe is not that strange a combination. Many of the Zijpe men were involved in whaling in the Arctic. They would have met local people and perhaps hired crew members there. Wouldn’t it be fabulous to find that connection! Good luck Yvonne. I’m so glad that you are being honest with yourself and I hope your quest pays off. I’m sure you’ll enjoy the journey even if it doesn’t end up as you hoped. Best wishes for success. 🙂 I will be following your posts. Thank you! I’m sure I will have fun regardless of the outcome! I too am an Eleanor groupie and have been for many years. Good luck in your research. I will follow it with interest. Hello there, my name is Aliénor and I am also a direct descendent of Aliénor d’Aquitaine! My great grandmother was a geaneologist herself and traced our family lineage back to her and which lead my father to name me after her. I would love to get into contact with you to compare notes of hers.